A very large tree native to the pacific northwest, whose wood is used primarily for outdoor applications such as roofing shakes and shingles, decks, posts, and siding. 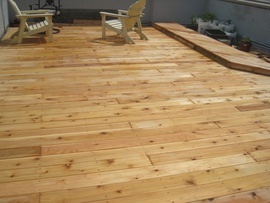 Western red cedar is a durable wood that is resistant to rot, decay, and insects. It is also versatile and can be finished many different ways. In most parts of the country, western red cedar costs over three times as much as pressure-treated wood. On the west coast, it costs considerably less than in other areas.